Due to circumstances related both to Mother’s Day and the contents of another post, we will not be attending the actual Bats Day Festivities on Sunday. However, we did attend the Black Market today at the nearby Doubletree, where we purchased many gothtastic accessories, as well as meeting up with an old friend. As a general summary, the Black Market was set up in the same manner as any other convention exhibitor’s hall, but with a very focused goth theme (although the occasional steampunk table was available). It’s pretty sizable, covering three rooms, but with very little in the way of walking room. The booths offered a nice mix of clothing, accessories, spooky stuffed animals, and even baked goods. My one disappointment is I was hoping to find a shop selling cloaks, but it looks as if the poor timing of having Bats Day the same weekend as RenFaire has resulted in a lack of any medieval style clothing. However, the gap was filled by a handful of steampunk booths, so maybe that’s okay. Blackmarket Bakery – It’s not often you see a counter culture bakery, and this OC favorite was serving up such appropriate goodies as chocolate bat shaped cookies. We shared one, it was a little dry, but tasty enough we’ll probably hit up their brick and mortar location sometime soon. Funky Recycling – Green is the new black? This booth was selling super cute and eco-friendly necklaces, pins, and magnets made from the aluminum cans of a variety of tasty beverages that have been recycled into artsy shapes like cupcakes, and Baron Sameti style skulls with top hats. 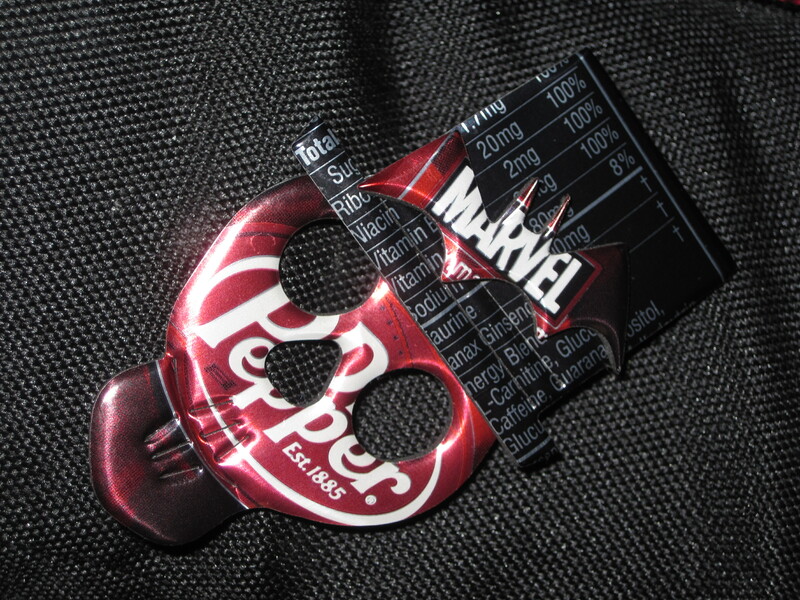 I picked up a Dr. Pepper themed skull and top hat pin that even was adorned with a Marvel logo bat. RetroScope Fashions – This was one of the aforementioned handful of steampunk themed booths, selling a nice collection of Victorian style clothing in a variety of colors and styles. There are more than a few steampunk clothing websites out there, but finding somewhere you can actually view the quality of said items is pretty rare. 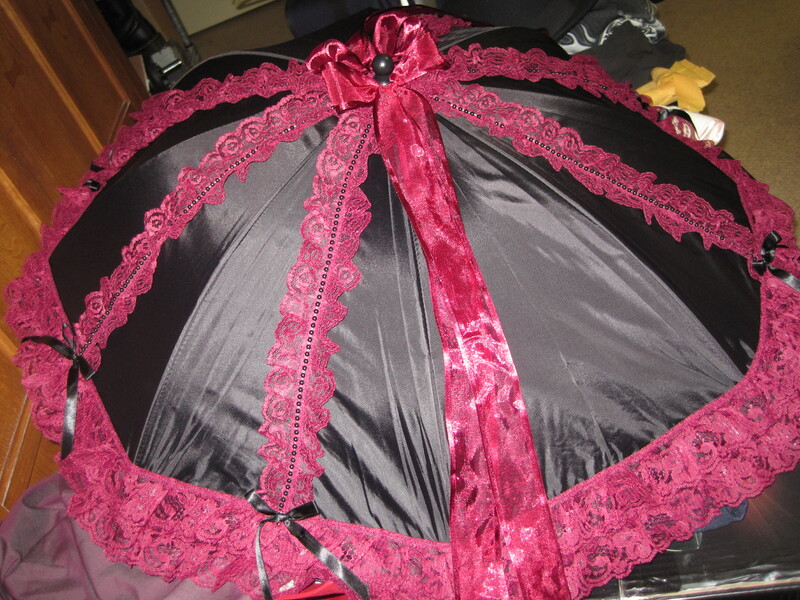 These seemed to be well crafted, although the only purchase I made was a parasol that perfectly matches my existing burgundy and black lace themed costume – which was greatly in need of a parasol. Be sure to ask them if you’re looking for something specific – I had originally passed them by because they didn’t appear to have anything that worked with my wardrobe, but when I asked if they had anything in a burgundy wine color, they produced this beauty from the back of the booth. Remember – it always pays to ask (or it costs to ask in this case, but it was a damn fine Mother’s Day present if I do say so myself). Lair of Wolf & Moon – Our best find of the day was this booth. We purchased a spooky looking skull/claw ring which looked pretty badass despite being pewter, but it was only $10, so that worked for us. 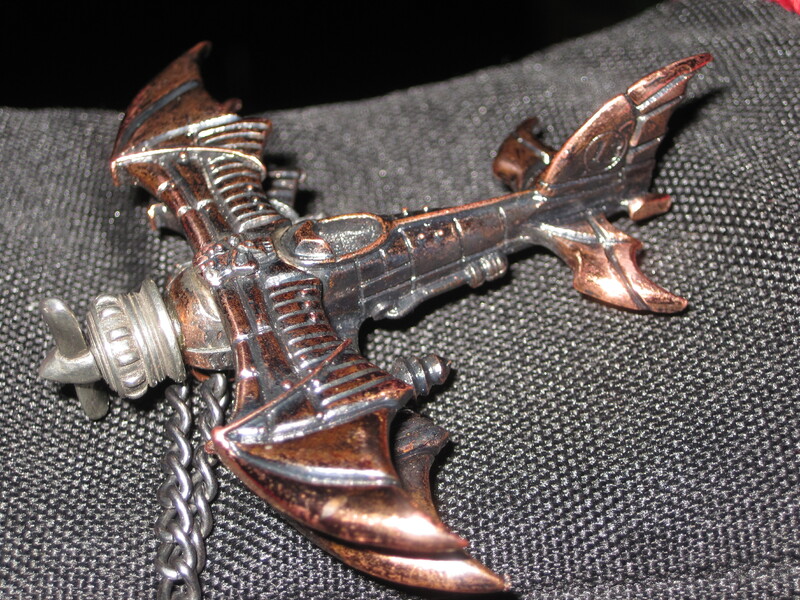 We also picked up what was arguably the most awesome bit of jewelry in the whole market – an amazingly detailed gothic steampunk bi-plane pendant. The bi-plane itself is so awesome looking I gave it a spot on our dresser instead of hiding it away in the accessories drawer (and it has a turning propeller! Squee!). The biplane pendant is the work of a British company called Alchemy Gothic which apparently does some pretty amazing work. The booth also had an impressive collection of goggles, gas masks, and hair falls, so I’d recommend checking them out for those, too. We plan on purchasing one of the more steampunk themed gas masks in the future. Overall, this was good times, and we came away with fliers and business cards for a variety of merchants we will have to check out when we have more money to spend. If you didn’t get to go, I’d not only recommend the above merchants, but also checking out the main Bats Day site for a helpful listing of links to a number of the vendors who had booths at the marketplace. And put a note in your calendar to go next year!